Looking for the perfect Valentine’s day gift? 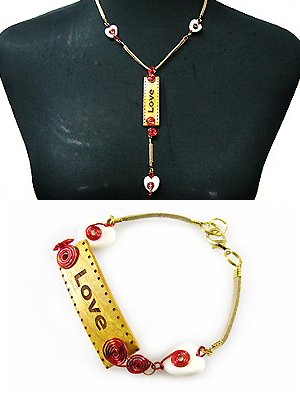 Why not give your Valentine a beautiful and meaningful jewelry? Forget about teddy bears and chocolates, do it different this time and give jewelry instead. Whether your Valentine is an adventurer, a lover of luxurious brands, a hippie or just a laid-back person, she will definitely love and appreciate the effort that you put into selecting the piece of jewelry that suits her style. Heart Necklaces. Valentines day wouldn’t be complete without hearts — not literally of course! Look for heart-shaped necklaces and surprise your Valentine with one. Be it pendants or chains, heart-shaped necklaces come in a variety of lengths like mid-length and extra long. If you want to choose an edgy look, go for a choker style necklace. Heart Rings. Another great gift idea are heart rings. Be it sterling silver, precious stone or diamonds, adorn her finger with a ring in the shape of love. But first, know her ring size and look for a design that she would love to wear in the years to come. Birthstone Jewelry. Let your significant other know that you value and appreciate everything she’s done for you. One best way to show your appreciation is to surprise her with a beautiful piece of birthstone jewelry. Whether it’s an amethyst necklace, a pair of garnet earrings, a sapphire ring or a citrine bracelet, she’ll be delighted to see that you don’t only value her birth month but also, you have good taste in women’s jewelry. Handmade Jewelry. If you want a personal approach to your gift, handmade jewelry is the way to go. Whether you want to go for overstated and bold pieces or simple and elegant ones, giving handmade jewelry is special and has a more personalized feel to it. There are plenty of materials that you can work on ranging from earthy jewelry to coral bracelets and dazzling gemstones. Pearl Jewelry. Symbolizing innocence and purity, pearls have a classically feminine look and can be worn at any occasion. This Valentine’s day, let your loved one look timeless with a pearl necklace. Pearls come in a range of colors and this timeless gift is something that she will surely hold dear for the rest of her life. Dangle Earrings. Want a pair of jewelry that can let you transition from day to night? Dangle earrings are the best choice. Now if your Valentine opts for subtle jewelry styles, choose a pair that is short, round and has a solid metal like gold or sterling silver. If you’d like a jewelry that will stand out, go for pieces that are in vibrant colors, sparkly and has length. Chocolates, flowers, teddy bears, and cards are some of the gifts most girls receive. To break the tradition, why not give a jewelry instead? This will surely win your Valentine over!